History of the surname Dalton. This is an ancient locational and aristocratic surname which derives from a number of places thus called in northern England. This could be Dalton in Durham, Lancashire, Yorkshire, Westmoreland and Northumberland.,Dalton’ derives from the Olde English pre 7th Century “doel” – a “valley” or “dale” and “tun” – a farm or settlement, and was originally given to those who like the examples below, held lands at such a place. (The place name is chiefly found in hilly districts). In the modern idiom the name has at least four spelling variations including Dalton, Daulton, Daughton and Dawton, although all have exactly the same meaning, the spellings being differenced by local dialects. Early examples of the name recording include William de Dalton of Northumberland in 1273, Richard de Dalton of London in 1293, and Johannes de Dalton of Yorkshire in the 1379 poll tax rolls. At the famous battle of Boroughbridge in 1322 and at the siege of Calais, France in 1345, Sire Robert de Dalton’, believed to be a Yorkshire knight, bore a coat of arms with the blazon – blue, crusily gold, a lion rampant gardant in silver. These are ancient arms which predate the establishment of the College of Arms in London. The first recorded spelling of the family name is shown to be that of Henry de Dalton, which was dated 1273, in the “Hundred Rolls of Northumberland”, during the reign of King Edward 1, known as “The Hammer of the Scots”, 1272 – 1307. ‘ Copyright: Name Orgin Research www.surnamedb.com 1980 – 2010. Information wanted on Rev. James Dalton & Rev. Cecil Wray Dalton. Howard Dalton is doing research on Rev. James Dalton [1831-1862] only son of Rev. Cecil Wray Dalton. 1st vicar of Grewelthorpe. Some records state that Cecil was vicar from 1847 others including Crockfords Directory states from 1858. He was living at Friars Hurst, North Stainley in 1851/1861 and the parsonage in 1871. Are any details known of his posts or occupation from becoming Curate of Dinsdale in 1831 to becoming vicar of Grewelthorpe. If you can help Howard please email him. Found in Mickley Parish Register. CECIL WRAY DALTON. Buried at Mickley on 19.6.1888. age 82. Former priest of Grewelthorpe. Address given as Masham. 1911 census return for Grewelthorpe. The Hutts. 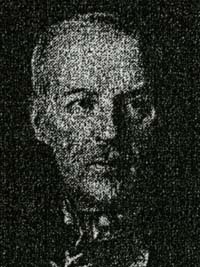 JAMES CECIL DALTON. Age 62. 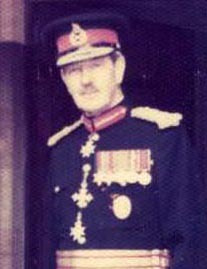 M. Maj.Gen late Royal Artilliary. born Halifax Nova Scotia. MARY CAROLINE DALTON. Wife. Age 47. M11 years. 4 children. Born Colchester. MARY FRANCES ELEANOR DALTON. Dau. Age 10. Born London. CHARLES JAMES GEORGE DALTON. Son age 9. Born London. JOAN CAROLINE WRAY DALTON. Dau age7. Born Plymouth Devon. JOHN CECIL D’ARCY DALTON. Son age 4. Born Suffolk. 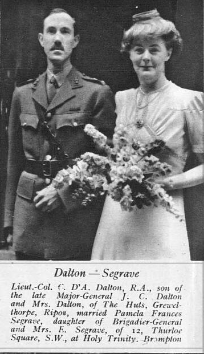 Marriage of J.C D’A Dalton in 1942. MARY FRANCES ELEANOR DALTON. Married Lt. Colonel George Aubrey Howard Vyso in Nov.1926 in Grewelthorpe St. James Church. They had a guard of honour made by the wolf cubs and girl guides who had been captained by the bride. Captain CHARLES JAMES GEORGE DALTON. Married Daphne Evans. of Amberley Court Monmouth. on April 15th 1936. She was the step daughter of Lt Col. F.A. Macartney. The bridegroom who is at the staff college Camberley represents the 4th generation of Daltons to serve with the Royal Artilliary. His Father the late Major General James Dalton of the Hutts Grewelthorpe, was a Colonel Commandant and his grandfather the late Lieut Colonel C.J.Dalton commanded. [Ref. Yorks Post & Leeds Intelligencer newspaper report March 1936]. 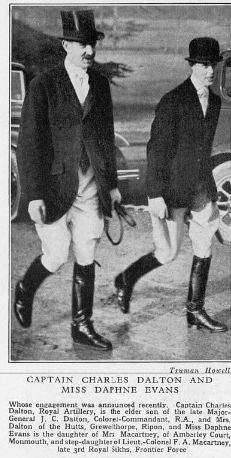 [ Photo from Tatler magazine 1936]. Major General James Cecil Dalton. 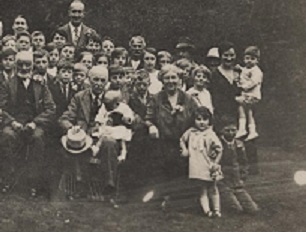 80th birthday celebrations Sept 1928. On the occasion of General Dalton’s 80th birthday all the children of Grewelthorpe school had the honour of being invited to tea at The Hutts. General & Mrs Dalton accompanied by Colonel Mrs Howard Vyse. and their grandson Master Howard Vyse received their little guests on the terrace. Here William Stelling. senior boy of the school, on behalf of his school fellows, presented to the General a Wahl Eversharp pencil with their best wishes. Tea was served on the terrace, with tables daintily decorated with sweet peas. Each guest wore their sweet peas and at the invitation of the General a group photo was taken. 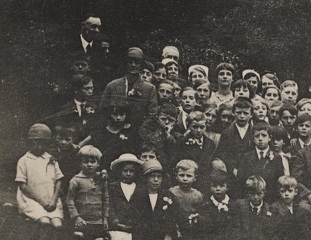 Dorothy Manning thinks this is the group photo taken at this event. The sweetpea buttonholes can be seen. The children were then free to explore the grounds and woods and afterwards games were played. Refreshments were again served before leaving and each child received a large South African orange and a packet of motoring chocolate to take home. All were loud with their thanks. Major General Dalton who died in 1931. OBITUARY For Major General Sir Charles Dalton. as reported in the Ripon Gazette 13.1.1989. Major General Sir Charles Dalton who lived at The Hutts was High Sheriff in 1972. He was awarded the OBE in 1941, the CBE in 1954 and made Companion of the Bath in 1954. He was knighted in 1967. Educated at Aysgarth school, Cheltenham College and the Royal Military Acadamy in Woolwich. he was commissioned into the Royal Artilliary in 1921. After service in Egypt and India he went to Staff College at Camberley. he commanded several divisions in India and Burma then after the war spent a period at the War Office. For ten years he was Director General of the Zoological Society of London. Sir Charles who spent over 20years as church warden for St.James’s Church in Grewelthorpe leaves a widow Daphne and two daughters. On Wednesday last Mrs Dalton gave the children of Grewelthorpe school their annual party at the Hutts. The infants were kindly taken up by Mr John Dalton. by car. Swings had been erected under the trees and a field was put at the disposal of the children for cricket and other games while the free use of the grounds and woods provided ample scope for an enjoyable time. Tea was served in the house and before the children left for home they were given further refreshment and a packet of chocolate. Mr Reid thanked Mrs Dalton on behalf of the children who showed their appreciation with ringing cheers. Reported in Ripon Gazette January 1958. The death announced of Mary Caroline Dalton. age 93. [Born 1865]. The widow of Major General J.E.Dalton of The Hutts, Grewelthorpe. 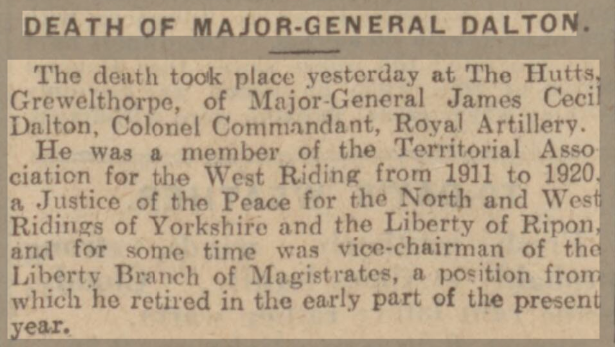 Reported in Yorkshire Post & Leeds Intelligencer 28 Jan 1932. MISS C. CREGSON The death occurred on Tuesday at 30. Eaton Terrace, London, S.W.. aged 84. of Miss Caroline Gregson daughter of the late John Gregson, M.A., barrister-at-law, of Bramham House, Boston Spa, the descendant of old Yorkshire and Durham families. John Gregson, living in 1537, purchased lands of Lord Lumlev at Murton, Co. Durham, in 1576. The late Miss Gregson and her cousin, the late Major-General Cecil Dalton. of The Hutts, Grewelthorpe, (who died in November last), were both proud of the fact that their ancestor, the famous Captain John Dalton, was the brave commander of Trichinopoly Siege in 1752-4. Through her grandmother, nee Maria Gibson, the late Miss Gregson was also descended from Dr. Edmund Gibson, Bishop of London, and her brother-in-law. the Rev. William Salmon Mare, was the Vicar of Bramham 1862. JOHN DALTON. Born 1725 son of Captain James Dalton. Was in the force sent to the aid of Muhammad Ali against Chanda Sahib near Trichinopoly, India. He was made Commandant in 1752. Fought bravely against famine, treachery, blockade and the French. Relieved by Major Stringer Lawrence May 6th 1753 and again Sept 21st. resigned from the service in 1754 and returned to England. Other Daltons in the area. MARGERY K. DALTON. Born 18 March 1914. Dau of Robert [hotel manager] & Linda. Barmaid in 1939. Married George G.S. Courtney in 1948. 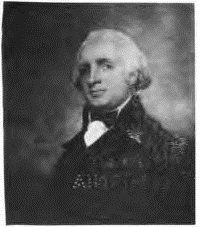 ROBERT DALTON. Born 31 Dec 1889. Hotel manager at the George & Dragon Hotel Ripon in 1939. Married to Linda [born 1892].